Home /Virtualization » What is actually VPS hosting and how to choose a reliable VPS provider. Everyone who creates a website or web service faces a number of problems, and one of the most difficult tasks is to choose between numerous hosting offers. The budget for most beginners is very limited, so that they do not have many options. One of the most suitable offers is shared hosting. This is an ideal choice for sites that have not yet become popular, that is, with low attendance. But if the load on the site can significantly grow in the near future, or a highly loaded project, for example, an e-commerce site, is hosted on the same physical server, then this option is not the best. In such situations, VPS hosting is the best solution. For a slightly higher price you will get better functionality, security and a number of other advantages. In the case of VPS hosting, each web site or web service is hosted on a virtual private server that is located on a fairly powerful physical server. The physical system is divided into several virtual ones: the software isolates virtual servers and manages their collaborative work. Virtual servers operate independently of each other, so when you host multiple sites on a physical server, they do not affect performance from each other. Each virtual server receives the resources allocated only to it. The VPS owner gets full access (root) to his virtual server and can work with him in the same way as with a dedicated physical server. Virtual servers in the case of VPS share the resources of their physical server – its processors, RAM, the storage subsystem capacity and the network bandwidth. 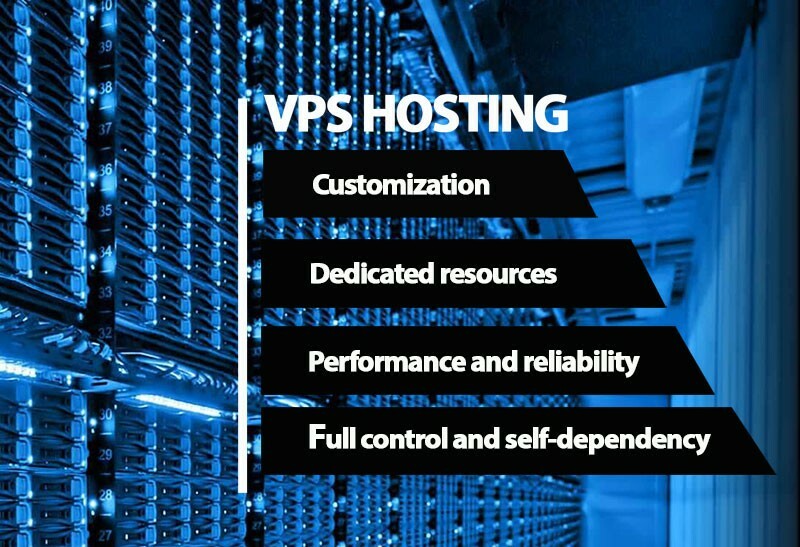 Thus, VPS hosting gives you full control over your server and has practically the same advantages as a dedicated physical server. At the same time, a virtual server is much cheaper than a dedicated server, and its performance is higher than that of virtual hosting. VPS-hosting is the “golden mean” between virtual and dedicated hosting. It combines the acceptable cost of virtual hosting and the independence and power of the dedicated. Unlike virtual hosting, where the resources are common, and your site can be affected by “neighbors”, here the picture is different. Each virtual server is an isolated environment, and you have access to all the capabilities of a physical server, but at a much lower cost. So whats different and why you might need to switch to VPS? While the traffic of your site or service is small, you do not need to increase the budget – the site or service will feel good on virtual hosting. However, with traffic growth, most virtual hosting servers will no longer be able to provide the required performance. One of the signs is the increased page load time. Overloading can also lead to frequent inaccessibility of the site from the outside (it regularly falls). If there are such symptoms, then virtual hosting for the good work of your site is not enough. Sometimes hosters notify customers that their site has run out of resources for the current month. In this case, it’s time to switch to VPS-hosting. If your site has a lot of multimedia content, then it will also require more powerful VPS hosting. How to choose VPS? Some key factors. With virtual hosting, you do not have access to the server as root, so the issue of server management is not worth it. But in the case of VPS, the entire virtual server is yours. Therefore, it is necessary for someone to look after him, control the performance. If these functions are taken over by the VPS provider, this is managed hosting (managed VPS), and in the case of unmanaged (VPS) you are responsible for your virtual server. Unmanaged VPS are prepared only for root access, and users will need to install and configure the software, control panel, provide server protection and support / maintenance. Unmanaged hosting will require you to monitor the performance of the virtual server and maintain its performance. If the server “crashed”, or if there were any security problems, then you solve them – you are the only administrator of your VPS. This option is more suitable for professionals with professional server management skills. So if you are a seasoned pro, and are familiar with such things as the correct shutdown of the system, its restoration, restart, server reboot, then unmanaged hosting can be an appropriate option. As for “normal” users and business owners, they should pay a little more and use a managed VPS: the server will be monitored by a professional system administrator in 24×7 mode. And users can do more familiar things for themselves. Again, the degree of this control can be different and depends on the hoster and hosting plans. This should be borne in mind when comparing different VPS plans or hosters. VPSRoom servers is fully managed. The configuration of the server plays an important role in the speed and performance of the site. How much processor power, operational and disk memory you get – it all matters. In addition, it makes sense to ask, which physical server will host your VPS. It’s better if it’s powerful enough equipment of a well-known brand. And if the foundation is weak, it is difficult to expect the stability of the entire structure. Many VPS hosters guarantee 99.9% reliability. However, the declared indicator may differ from the actual one, and it is always useful to get acquainted with reviews on the Internet. For reliable and relatively uninterrupted operation of the site, this indicator should not be lower than 99.95%. Redundancy usually involves reserving resources, especially in the Data Center. For example, if the main power fails, the UPS and diesel generators start working. If the provider has problems with network, then there must be alternative communication channels. If one physical server is overloaded, then it must be stable, etc. Scalability, in turn, means the ability to cope with a sharp increase in the load on the server, usually due to reserve resources. All this means increasing the time of trouble-free operation and consistently high performance. Most VPS providers limit the bandwidth for a virtual server and may charge a separate fee for an additional one. When choosing a VPS hoster, it’s worth making sure that you do not have to pay too much for sufficient network bandwidth. At VPSRoom the bandwidth is unlimited. Regardless of the performance of your hosting provider and the functionality offered, there are always some problems. In this case, convenient and effective support is needed. If the hoster is not able to provide 24/7 support, it simply is not worth your money. When your site will be idle for a long time, it can lead to outflow of visitors, and maybe to serious financial losses. It is useful to first test the hosting provider’s support service, and then decide whether it makes sense to contact it. Of course, to choose a hoster, you need to know the cost of its services. The price depends on the type of service (managed or not) and the resources allocated. What kind of hosting plan best meets your requirements – it’s up to you. The closer the server is to your audience, the more efficient it will be for users to access it and the higher the chances of rising in the search engine rankings. Web analytics tools help to understand where the target audience is concentrated, and find the VPS closer. You can also create a copy of the VPS, but you should take into account the data transmission distances and the responsibilities for securing communications between remote servers. Assigning multiple IP to one site, for example, having domains in different languages (mysite.co.uk, mysite.ru, mysite.it, mysite.ca, etc.). At VPSRoom we offer up to 5 dedicated IP Addresses but if you need more you can contact us and explain your requirements. As your site grows and develops, VPS hosting becomes a necessity at some point, and you should carefully select the service that suits your preferences.